"One of the saddest things I remember is my Aunt Lena and Uncle Ed were staying with us. They had a baby boy about a year old and he died. The thing I still remember is their putting the iron crib in the back of the spring wagon and fixing it all up and putting him in there to take him the fourteen miles to the place where he would be buried and get a casket for him. His sister my age and I sat and cried for so long until we could find out more about what was done with him. 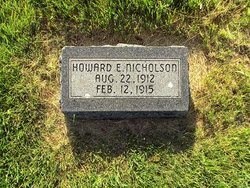 His name was Howard Nicholson." My grandma would have just turned five in 1915, when he died. Nowadays, if you have a child, it is extremely likely that he or she will survive into adulthood, and well beyond...I think we kind of take that for granted. It was so different, even just 100 years ago. As a public health major, I learn a lot about infectious diseases, and the leading causes of death in the early 1900s as compared to now, and things like that...but I still never get used to coming across so many dead children in my family tree. Rest in peace, Howard...gone but not forgotten! If you find my site by googling any of these names...please send me a note or write a comment! I would love to hear from you...and I don't bite!